Hit 100 subscribers on Random and Rhyme ~ Thank you everyone! Celebrated the 5 month anniversary of Random and Rhyme! Releasing my 3rd book on BookCrossing.com – Bird by Bird by Ann Lamott sometime during my California road trip ~ be on the lookout! A great week and it should get even better with our California road trip just a few days away. I have been driving by Bagel Brothers for 11 plus years, it’s right down the street from me near the liquor store and the post office, and yet I had never stopped in for a bagel. But this week I was on my own for lunch and trying to decide from 2 or 3 of my usual picks as I was driving by the strip mall where Bagel Brothers is located and in my quest to “Discover Home” I pulled my car in to give them a try. In a word ~ Yummy! 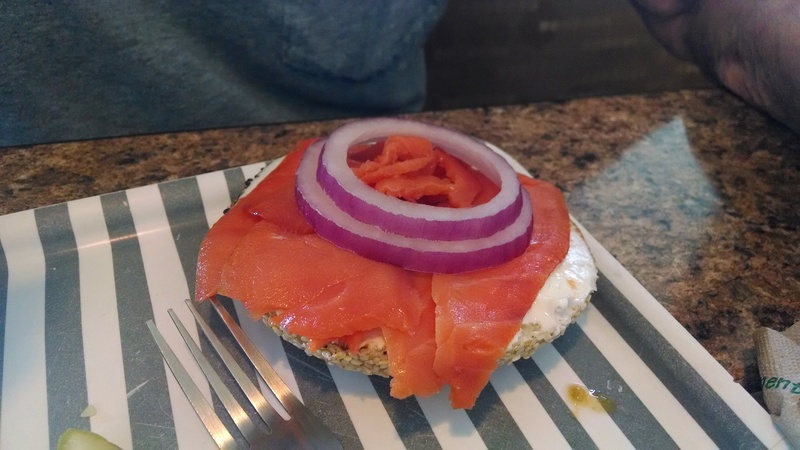 I had a sesame bagel with cream cheese, capers, and lox and it was delicious! The lox’s were perfect, the fresh bagel was toasted to perfection and had just the right about of cream cheese. The staff was very friendly and helpful, offering a first timer great service and excellent suggestions. And my timing couldn’t have been better, because I found out that on Saturday they were having their 20 year anniversary and were offering plain and cheese bagels for $.20each and two for one espresso drinks. So I drug my husband down to give it a try and score some anniversary bagels. He loved it too! Score another plus in the “try new places” column for “Discovering Home“! I now have a frequent visitor punch card with three punches, I see a free bagel in my future. Do you have a business in your neighborhood that you have driven by a dozen times and still haven’t stopped?